Westlake conducts its business in a responsible manner that protects the health and safety of its employees, the public and the environment in which we live. We have put safety first, and it will remain our number one priority. No job can be so important or urgent that people cannot take the time to work safely. Life is precious and irreplaceable." 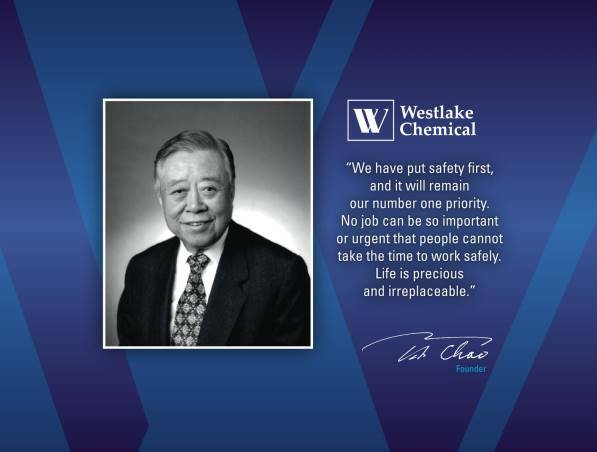 We are proud to have two Westlake chemical facilities in the United States that have earned the prestigious Occupational Safety and Health Administration (OSHA) Star status. This is the highest award offered by the Voluntary Protection Plan (VPP) and is reserved for participants that exceed OSHA standards, thereby making them models for our industry. We are actively pursuing VPP certification at several of our other facilities. For nearly four decades the vinyl resin industry has designed and implemented worker safety best practices and new technologies that continuously improve our facilities’ health, safety and environmental performance. In 2017, the Vinyl Institute (VI) created a video, “The Vinyl Industry's Culture of Safety," that features Westlake's Geismar, Louisiana employees and site. To view the video, click HERE. Our Cultural Beliefs help employees understand how they should work together to live out our Core Values and achieve our goals. Drive to Zero, Westlake's first cultural belief, is built upon the principle, "I own your safety and mine." This cultural belief recognizes that safety is the company's number one priority, and demonstrates Westlake's ongoing commitment to the values on which it was founded. Click HERE to learn more about Westlake's Drive to Zero cultural belief.